1 Preheat the oven to 170°C, gas mark 3. Slice the tomatoes in half lengthways. Warm the rapeseed oil in a small pan over a low heat, then add the saffron and remove from the heat. Leave to steep for 5 minutes. 2 Toss the tomatoes in the saffron oil with the paprika, brown sugar and vinegar. Place in a roasting tray cut-side up in a single layer and bake for 1 hour, until caramelised and sticky. Remove from the oven and keep warm. 3 Chargrill the bread on a griddle pan, then spread sparingly with the butter. 4 Remove the skins and stones from the avocados and mash the flesh roughly in a bowl with the lemon juice, a pinch of smoked paprika, sea salt and freshly ground black pepper, to taste. 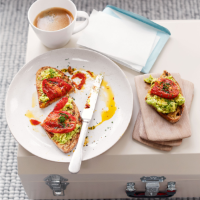 Divide the avocado between the toasts and top with the tomatoes. Drizzle with a little avocado oil and sprinkle with chives and extra paprika, if using, before serving. This recipe was first published in Tue Dec 23 12:03:13 GMT 2014.